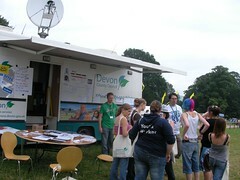 I was down in Devon last Friday at the county's fantastic Kongomana youth festival. Alas, however, I wasn't there to chill out and enjoy two days of activities and socialising. I was there along with Carl and Russel to find out what young people thought of Devon County Council using social network sites for youth participation (all part of the Youth Work and Social Networking project, and building on work I've been doing over here). I'll share more later on about how we used magnets, the side of a bus, and little cut up bits of Bebo on cardboard to ask young people about the sorts of policies, rules and safety guidelines the council should use. For now, I just wanted to share a few quick reflections on using cheap video cameras for consultation. Devon County Council got hold of 5 Busbi Video cameras (Â£29.99) each which we could hand out to young people throughout the day. The cameras are very simple to use, with an on/off switch, and big red button to start and stop recording. 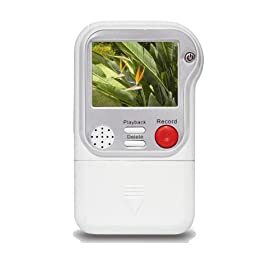 Even more useful, they've got a space where the battery compartment is (they run off AA batteries) where you can stick a question onto each camera so that the camera operator can read it. We used questions such as 'What three words do you think of when I say Bebo?' and 'How could councils use Social Network Sites to help you get your voice heard?'. During the chaos of running our paper-based consultation on social network site policy we were handing out the cameras to groups of young people to borrow for 5 to 10 minutes to go and interview their friends with the question on the back of the particular camera they had borrowed. That way, so the theory went, we could get in views from a far wider range of young people. And the responses would be young people talking to young people – without the usual young person <–> strange adult dynamic that can occur during quick consultation exercises. The cameras were borrowed and the cameras came back. Throughout the day groups of young people were taking the cameras to go and record things. We had to help one or two groups get started using the cameras – and had to keep turning them off as they almost always came back still turned on and draining the batteries (although the batteries all lasted). We didn't get chance to watch any of the video coming back in until we were packing up – and the first few clips I watched were not very promising. Mostly video clips of the grass as people were running places with the cameras. However, as I watched through the rest of the clips I found a lot of really good content. Simple questions like 'What three words do you think of when I say Bebo?' had gathered a lot more responses that 'How could councils use Social Network Sites…' – but between the five cameras there was a lot of content, and, importantly, content that we hadn't been hearing from standing around and talking to young people in our more static consultation activity. What did we learn about the method? Young people talking to young people offers real insights: a lot of things came across in the video clips that didn't come across in our other conversations. Young people talking to their peers often do so in a more relaxed way. There is a lot of joking around in the clips that came back – but also a lot of really good comments and remarks that provide great insights. Keep the questions simple: test out your questions first on the young people you expect to take the cameras round and interview people. If you need to provide any clarification of the question – then it won't work in this method. Even point-and-shoot needs some guidance: I had hoped that the video clips we captured might be usable to edit together into a video report of the consultation. However, whilst the audio on most of them was usable – the video clips were rarely framed well (and often were super-close-ups or cut people's heads off). In the future I'll try to add some sort of guide onto the screen of the cameras to show how to frame a show (a circle showing where someones face should be in shot for example). Bring spare batteries and memory cards – we were only running the consultation for a couple of hours – so managed to just use one set of batteries and memory cards per camera. But if you were running for longer – be ready with spare batteries and ready to swap out the memory cards (The Busbi Video cameras record onto cheap SD cards) so that the cameras can stay in use. The cameras may not come back – we had one camera that took a long time to get back to us (we had almost given up on getting it back). Loosing the camera would have been a disappointment – but we would have also lost all the clips recored on there. Thats why for some events you may want to have memory cards in rotation so that whenever a camera gets swapped over you change the memory card and save a copy of the footage captured up to that point onto a laptop etc. How could the idea be developed? I'm keen to try using the same method again – but also to explore other ways of putting recording equipment into young people's hands with simple prompts – and then seeing what comes back. I could imagine recording a short 'introduction to an issue' clip on the memory cards of the Busbi Video camera (the camera has a play button which plays back the last clip) and then sending the cameras in the post to young people across and area with a spare memory card. Young people would be invited by the video introduction to create a clip in response to the issue in question – and would be asked to send back that memory card. I'd love to hear ideas from others about how to develop this peer-to-peer recording for consultation sort of model. What have you done in the past? Or what sort of thing would you like to do? (Disclaimed: I have used an affiliate code on links to the Busbi Video on Amazon. There are other cheap digital video cameras on the market – and if you've got access to more durable kit already – the this method could work with that also. I just happen to have used the Busbi and found it to do the job for what I wanted). Thanks so much for such great advice! Posts like this are really helpful because they weigh out what worked and didn’t work. I’ve been thinking about purchasing some cheaper video cameras and doing activities like this. Your suggestions are beneficial to those of us wanting to create projects like this.Really liked the idea of putting the written prompt on the recorder’s side of the camera. And, I’d never heard of the Busbi camera. I’d heard of the filp camera, but I think I’ve heard recently that they’ve been discontinued (??). I’ll have to take a look at this item. Again, thanks. We did something similar in Malawi – worked especially well when a young person was assigned to a particular camera and trained up in using it (and keeping it steady!) (and keeping in mind they were kids unfamiliar with any kind of technology). On the otherhand some of our regular volunteers had all sorts of training sessions and chats about good filming tips and it was always 50/50 whether much of what they filmed was usable! So long as somebody is prepared to spend the time to filter & trawl through its definitely a useful way to get some raw responses albeit very time consuming. I’m really impressed by these busbi video cameras – totally within the reach of small voluntary organisations and easy to produce high impact results. 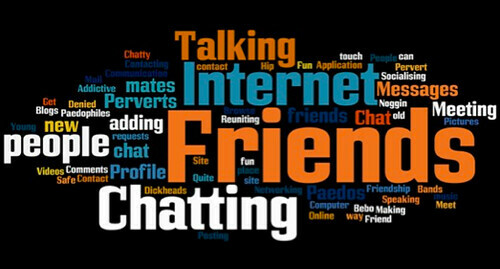 Really interesting to read your own experiences of using them and the use of the word cloud is simple but you immediately get a sense of the responses. Roaming cams to gather youth input is a commendable initiative. The idea lending the cameras is really in the spirit web2.0 manifest in the real world. Hope you’ll give this another go so we can see/hear the edited/packaged results. I’m the chief admin officer in the small town of Berwick, Nova Scotia and I’d like to adapt your ideas (and lessons learned) here. Wow! That is quite cool thinking, and quite cool execution. I’m going to check the camera out as well.